I've asked this on an Excel forum, but they've recommended posting to a statistical forum. 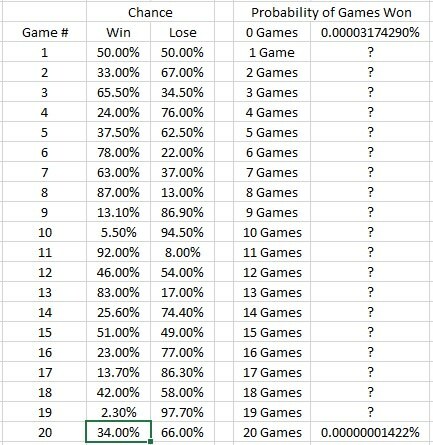 Please see the image below for an example of what I'm wanting to determine - essentially the probability for a given number of events occurring (games won in the example) out of a particular set of such events, wherein the probability of each event is different. I'm wanting to be able to perform this analysis for sets of 100 or more events, so a direct, brute-force approach is out of the question. Is there a way to automate this in Excel? There is. And brute Force us pretty much the only way to do it. But I think I have something lying around that does just that. I provided an excel worksheet to answer their question. Hopefully you can read that thread to get the logic behind the calculations and extrapolate from there to expand the sheet out for 20 (or 100) games instead of just 11. Dason - thank you; that was quite helpful!